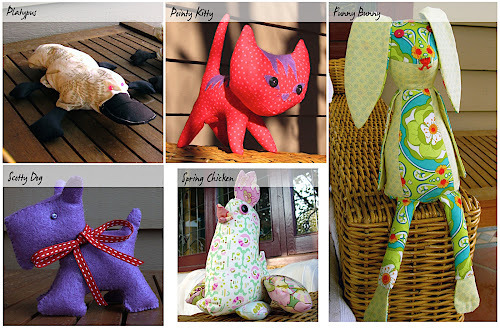 Note the pattern for this embroidery is no longer available or I wasn’t able to find it on Gail Pan’s designs site. Calico fabric: 9.5in x 13 in for the embroidery. Embroidery pattern by Gail Pan Designs. 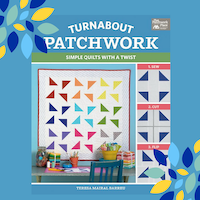 After the embroidery is complete, assemble the quilt sandwich and prepare it for quilting. Quilt together using stipple quilting. The closer together the stitches the stiffer the end result. 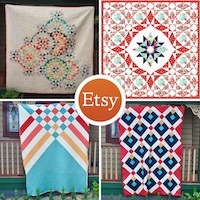 The hanging tabs are made of 2 rectangles measuring 8.5 in x 4.5 in each sewn in a tube. The buttons are covered in a matching fabric. Stitch tabs to finished wall hanging. 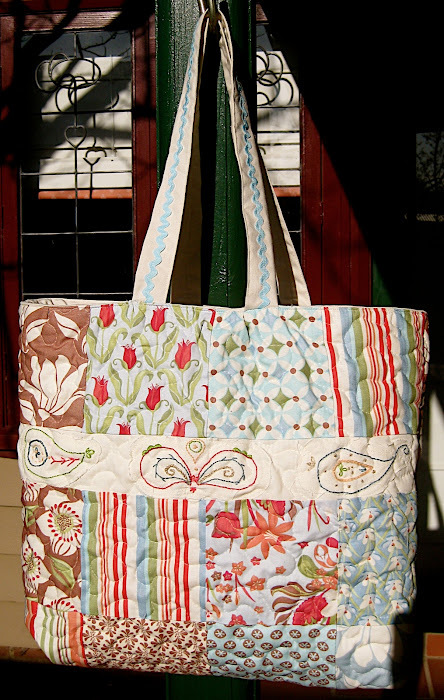 This tote bag is based on Mill House Inn Tote Bag. I used charm squares instead, adjusted measurements and added a pocket. Stitch the charm squares in two rows and then the rows together. 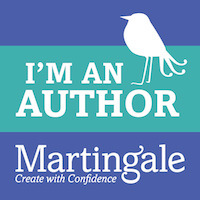 You will end up with 2 rectangles measuring measuring 18.5in x 9.5in. Measure the width of the rectangle now before you cut the next rectangles for precision sake. From the matching fabric cut 2 more 8in x 18.5in rectangles from the matching fabric to form the bottom of the bag and 2 pieces of 21in x 4in for the handles. Stitch both the charms rectangle and the bottom of the bag rectangle together to make the sides of the bag. Iron the handles in half all along and then fold each side inside and iron again. Stitch close to the edge of each handle. 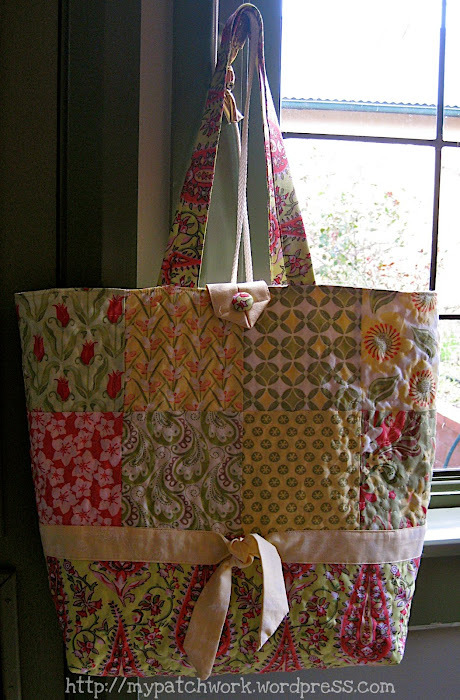 Place the side of the bag on a piece of batting and quilt. I used stipple quilting. When finished trim batting off both pieces. 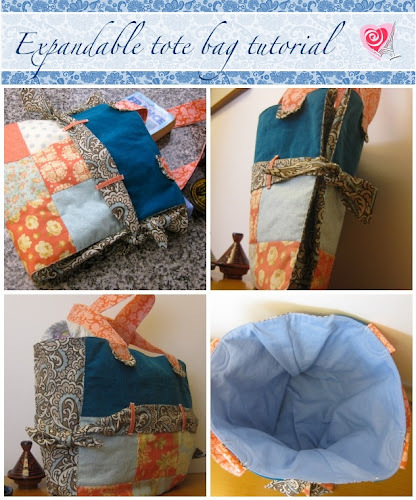 Place both sides of the bag right sides together and stitch around the sides and bottom. Make sure the charm packs corner are in line. Attach to the bag placing the stripe in alignment with the bottom fabric but overlapping 1/4in with the charms side. Find the middle of the stripe by folding the stripe in half length wise to find the middle and mark. Also mark the middle of the back of the bag where the second and third charm squares meet. Now fold the fabric in half length wise, this just helps with making sure it’s centered on the bag when you pin it. 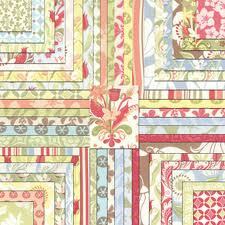 Pin the stripe to the bag lining it up to the bottom fabric and overlapping the charm squares part by 1/4in. When you get to the middle in the other side of the bag, tie a knot. 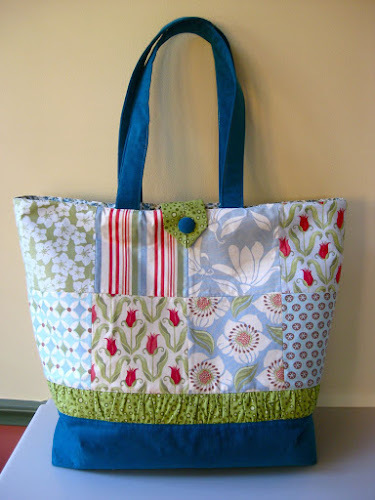 Sew the stripe on to the bag using a 1/8in seam allowance and sewing down the top and bottom of the stripe. Sew up to one inch before the knot. 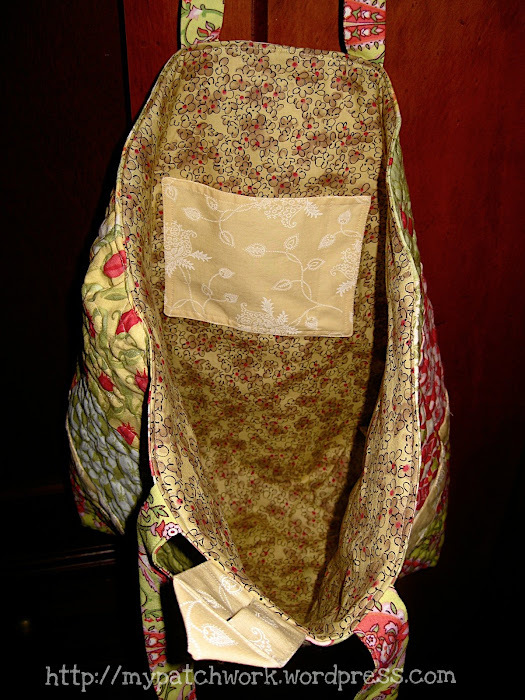 Turn bag inside out and make a mark 2 1/4in on each side from the corner. Then fold the bag making both marks match. Cut across and stitch leaving a 1/4in seam allowance. Pin at cut at the mark so it looks like this…………sew closed using a 1/4″ seam allowance. Do this on both right and left sides of bag. To make the pocket see How to sew a pocket tutorial. Cut 2 17.5in x 17.5in squares. Place both pieces right side together and sew around the sides and bottom. Leave 4in opening on one of the sides to turn bag inside out. Cut a rectangle measuring 6.5in x 4in for the loop closure. Make as per handles instructions. Fold and stitch as per picture. Pin handles on the middle of charm squares 2 and 3. Pin loop closure in the middle of the handles on the back of the bag. 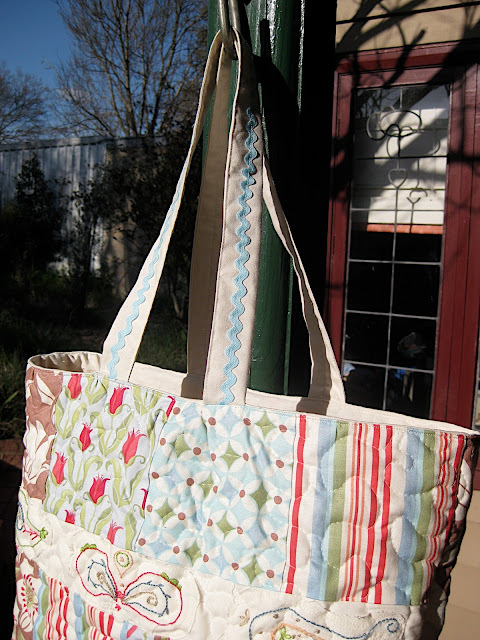 Put the entire tote bag inside the lining so that the right side of bag and right side of lining is together. Line up the tops of fabric and pin a few times. 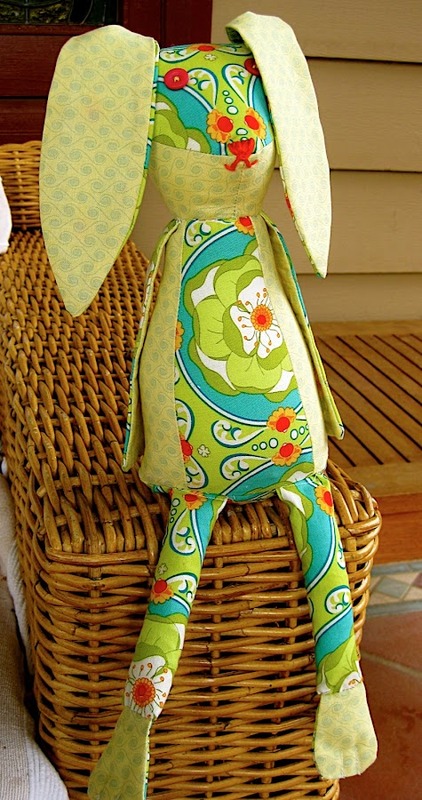 Now sew along the top all the way around using 1/4″ seam allowance. Pull the outside of bag through the 4in opening in the lining. Stitch the 4in opening in the lining. Neatly push the lining in the bag. Now stitch all around the top edge of the bag leaving a 1/8in seam allowance. Sew the button onto the front. 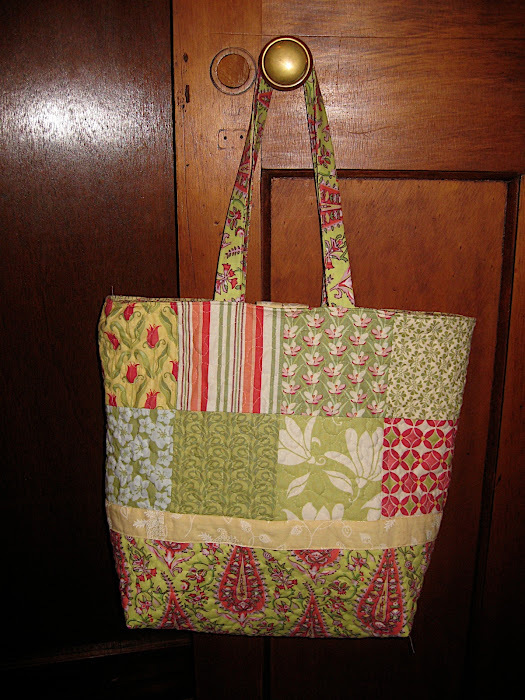 See my new tutorial for a similar tote bag with charm squares.